From its origins as a wholly voluntary organisation, the Library has grown into a thriving 19-woman team, working on our learning programme, with the collection, and keeping the Library running. Adele is currently taking a sabbatical to embark on a Clore Leadership Fellowship. You can read more about the programme and what taking part means to her in this blog post. Adele Patrick has been involved in Glasgow Women’s Library since its launch, first as a volunteer, then as the Lifelong Learning Development Worker. She now manages Lifelong Learning and is also responsible for the Creative Development of the organisation. Adele manages the Learning team, the Volunteer Coordinator, and the Mixing the Colours Development Worker and works with the Strategic Development Manager and the Board developing new, enterprising and cultural strands of the Library’s work. Adele is particularly interested in the creative and imaginative development of the Library as a unique; arts influenced provision that (re)defines through environment, learning approaches, programmes and resources what a library, archive and museum can be. Syma Ahmed joined the Library in August 2007 as the Development Officer for the Black & Minority Ethnic (BME) women’s project. She is responsible for promoting lifelong learning, arts and creative opportunities for BME women. Syma is keen to celebrate the success and achievements of BME women in Glasgow through capturing and compiling their life stories and preserving them at Glasgow Women’s Library. Syma has worked in the voluntary sector for over 6 years and enjoys developing new projects to support the local community. Her previous job with a unique charity called Ethnic Enable involved supporting disabled people and their carers from minority ethnic backgrounds. Laura joined the Library in August 2007 as the Lifelong Learning Assistant then in 2015 she became the Production Coordinator and is responsible for assisting with the development and production of the events programme, a role which she now job shares with Katie Reid. Laura has worked in the voluntary sector since 1998, mostly with events and learning organisations, and has a keen interest in promoting culture and learning for all. She is very lucky that her role allows her to develop her own cultural capital as well as helping others develop theirs. Katie Reid began working at the library in 2015 as Lifelong Learning Admin Assistant. Katie now job shares GWL’s Production Coordinator role with Laura Dolan. Coming from a background of working in the arts, Katie’s work at GWL supports the team with planning and developing the library’s learning and events programme in Glasgow. She especially loves it when someone new uncovers the joys and possibilities the library has to offer. Emily joined the library in October 2016 as Lifelong Learning Administrative Assistant (maternity cover). She supports the Lifelong Learning and Events Programme at GWL, which is always filled with a range of exciting and inspiring workshops, exhibitions, talks, screenings and heritage walks. Emily is an avid reader and is always making new discoveries in the library shelves. She graduated with an MLitt in Creative Writing from the University of Glasgow and is also a volunteer tour guide on GWL’s women’s heritage walks. Morag Smith studied English Literature in Glasgow then lived in Germany for some years before returning to Scotland where she worked in community learning and development, adult literacies, creative writing and literature development. In July 2009 she joined Glasgow Women’s Library as National Lifelong Learning Development Worker and now has a breathtaking knowledge of Scotland’s minor road and rail networks through taking the library’s learning programme to many places, including Aberdeen, Skye, Dundee, Inverness, Dunoon, West Dunbartonshire and Wigtown. She works with GWL’s learning team and a wide range of partner organisations, including libraries, community groups and women’s prison services, to deliver bespoke learning programmes, events, and workshops. She also develops new networks and access to the library’s unique resources for women of all ages and backgrounds. Morag is particularly interested in working with new partner organisations and community based women’s groups, and supporting and developing new projects which enable women to develop their skills, creativity and confidence and connect with their own life history and the histories of other women past and present. Rachel Thain-Gray joined the library in 2013. She has worked in the equalities for the past 20 years and delivered GWL’s Mixing The Colours, In Her Shoes and Mainstreaming Sectarianism in Equalities Projects. She is currently the Project Coordinator of Equality in Progress at Glasgow Women’s Library, which benchmarks GWL’s grassroots museum practice to address strategic needs in current sectoral approaches – the lack of embedding representation, access and inclusion of people with protected characteristics in organisational structures. 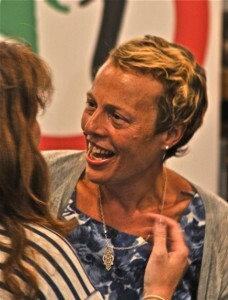 Rebecca joined GWL in 2014. She is a Development Worker and Project Assistant to the National Lifelong Learning Project, supporting the coordination and delivery of GWL’s work across Scotland. She has an MA (Hons) and an MLitt in Classics from the University of Glasgow, and an MLitt in Gender Studies from the University of Stirling. Rebecca has a background in higher education student support, including roles in placement provision, careers and employability, residential and pastoral support and fundraising. She has also worked in human resources and as a copywriter and proofreader. She is currently working on a PhD at the University of Strathclyde, using eco and veg*n feminist theory and feminist animal studies to research literary adaptations of the Prometheus myth and how these are conceptually linked to toxic masculinity, gender and species. Rebecca is the facilitator of the GWL Book Group and a volunteer tour guide on GWL’s women’s heritage walks. Donna joined the Library as a volunteer literacy tutor in 2010 and has refused to leave ever since. In her role as Adult Literacy and Numeracy Development Worker she works creatively with women with a wide variety of skills, ages and backgrounds – supporting them with their literacy to enable them to improve whatever aspect they want to focus on, to develop their confidence to allow them to progress, to feel better about themselves and to enable them to access a wide range of cultural activities. She loves supporting the women who come to GWL to do whatever they want to do – whether it’s to write a poem, do a crossword, set up a budget, put together a CV, write essays for college or help their children with their homework. She also gets involved in a wide range of activities at GWL, supporting ALN learners to access the huge range of wonderful opportunities that GWL offers. Donna has a Masters Degree in Community Learning and Development, a Masters in Gender Studies and is currently undertaking a PhD in creative writing. She facilitates creative writing workshops and GWL’s Drama Queens and loves women’s history, particularly the history of women’s suffrage. Having spent 25 years in the soul destroying world of pensions, Donna is so happy to have found her soul again doing something she loves. Dorothy joined GWL as Adult Literacy and Numeracy Tutor after working as a Community Tutor with West Dunbartonshire and then a Workplace Tutor for Glasgow City Council. The ALN post is an exciting opportunity to work with women who live locally and the wider Glasgow area. Dorothy’s role as tutor supports women on a 1:1 basis, helping them gain confidence with their reading, writing and number skills and to use the resources in the library to support their learning. Whilst studying for a Post Graduate Degree at Strathclyde University Dorothy grew to enjoy supporting people with literacies issues and being able to guide learners to become self-directed learners. In recommending GWL to others, Dorothy cannot tell others enough about the fascinating place the library is to visit, to learn and to meet other women, where they can feel adopted by a vibrant team who work together in a very supportive environment. Nicola was appointed GWL Archivist in 2014. She has also been one of the two archivists working on the Speaking Out: Recalling Women’s Aid in Scotland project since early 2016. Her role at the Library is varied and involves managing the archive collections, providing access to researchers and promoting the collections through outreach and engagement. Nicola has previously worked with the Spirit of Revolt Archive and Milngavie Heritage Centre. She enjoys being involved in archives that help preserve the histories of groups and movements often under-represented in mainstream history. She has an MA (Hons) in History and an MSc in Information Management and Preservation both from the University of Glasgow. Jenny was appointed GWL Museum Curator in October 2017 and is responsible for managing, caring for and increasing access to the museum collections. She is delighted that this role combines her love of heritage and literature and is looking forward to developing her knowledge of women’s history. Jenny began her museum career as a seasonal attendant at the Highland Folk Museum in 1996 while studying for her MA in English Language & Scottish Literature at the University of Glasgow. She has worked continuously in the sector since 2001. Previous roles include Education Facilitator at the National Museum of Rural Life, Education Officer at Paisley Museum and Outreach Officer in a pan-Lanarkshire partnership project. She still works part-time as Social History Curator at CultureNL. Sue John is part of the Senior Management Team at Glasgow Women’s Library. She takes a lead role in Strategic Planning, driving GWL towards achieving its vision and fulfilling its aims and objectives. This involves providing strong and inspiring leadership, ensuring that GWL works as a coherent team across the different strands of its work as a library, an archive, a museum and an innovative learning resource. Sue is also the Company Secretary of Glasgow Women’s Library Limited, ensuring that all legal requirements as a Limited Company and as a Charity are met and, along with Adele Patrick (her senior colleague in the organisation), advises the Board of Directors so they can provide robust governance and clear strategic direction for the organisation. Gabrielle Macbeth joined us as Volunteer Coordinator in 2011. Her role is to ensure that volunteers get as much out of volunteering as they put in and that they are involved in stimulating projects which makes the most out of their interests and motivations for volunteering. Volunteers are encouraged to try new things and broaden their horizons and are offered ongoing support as well as training to equip them with the skills and confidence to get involved in GWL’s wide ranging and varied projects. Gabrielle loves having the opportunity to find ways for so many talented and enthusiastic women to contribute to GWL’s work, and is always looking for ways to involve women from all walks of life who can bring fresh perspectives and experiences to GWL. Find out more about volunteering at GWL here. Hannah joined the Library in September 2016 as the first Digital and Marketing Officer. She is responsible for the organisation’s social media accounts, digital marketing activities and occasionally can be found helping out on the Library’s front desk. If you receive GWL’s monthly newsletter, it’s Hannah who is the one doing the writing and the sending. Hannah is interested in digital innovations in the library and museum sectors and hopes to continue to raise the profile of GWL, ensuring that as many people as possible know about the important work we do. The Library’s resident geek – Helen looks after the Library’s IT needs as well as more general admin tasks. All the Library staff can be contacted via email or at the Library. If you’re contacting the Library with a proposal for an event, exhibition, workshop or other project, please take a look at our guide to working with GWL, and submit a copy of our ‘Working with GWL’ form.